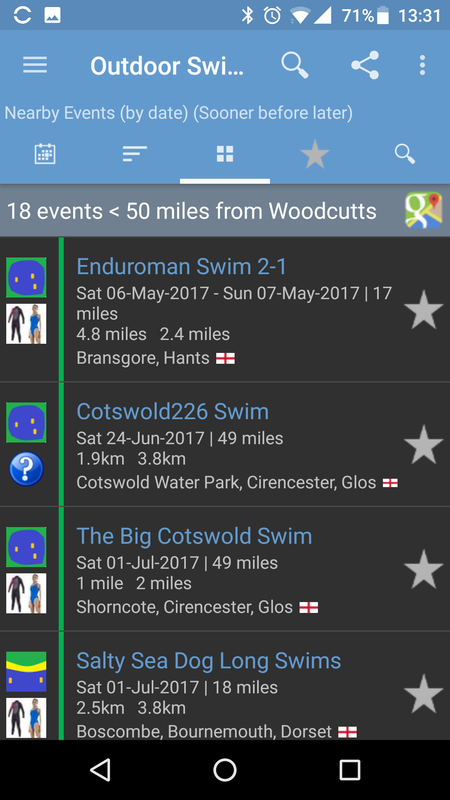 This website has been designed to help the user find Open Water Swimming events taking place across the UK and Ireland. The information on this website can be accessed on your phone or tablet using an Android app. See more details below. 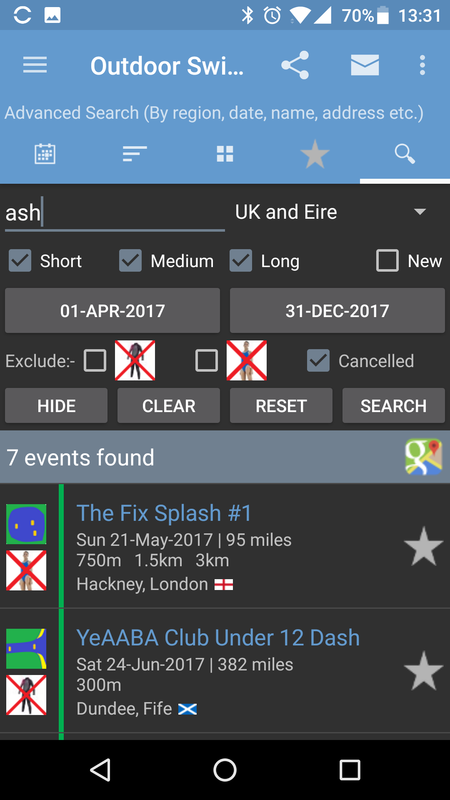 Use this app to find events across the UK and Eire. 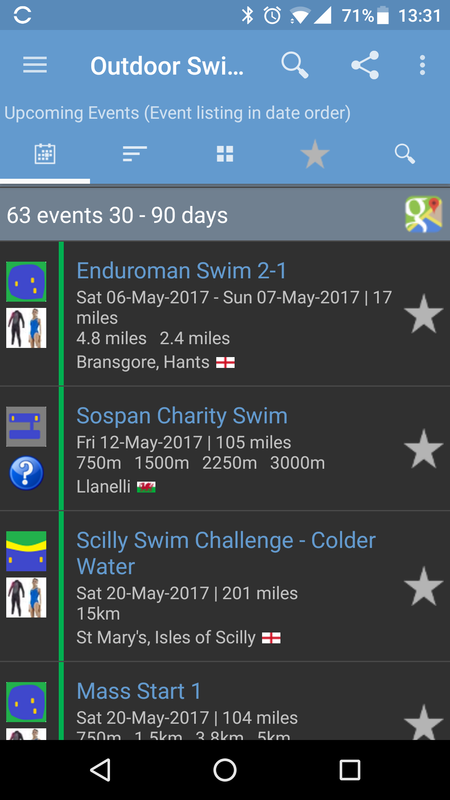 Details for each event include the date, the distances to be swum and the location. It will also show (when known) whether wetsuits or skins are allowed. By touching any event you will be taken to a details dialog from which you can see More Details, go to the relevant website for that event or see the event location on a map. Any event can be added to or removed from Favourite Events by touching the star. 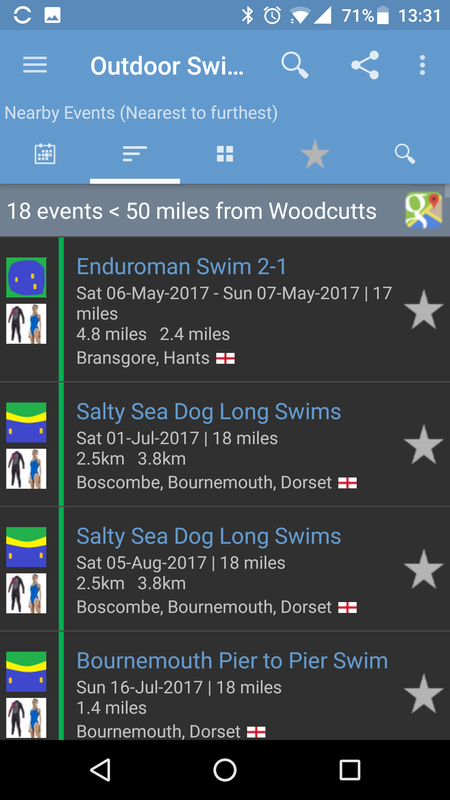 We compile the most complete listing of Outdoor Swim Events for the UK and Eire and make frequent updates so start using this app now to plan your swims. If you are viewing this website on a PC and would like us to send the apk to your Android device, then please click Before installing the app you will need to check that your Application Settings for Unknown Sources allow installation of non-Market apps. - What events are included in the listings? We currently include Open Water Swim Events in the UK mainland (England including the Isle of Wight, Scotland & Wales), Ireland (ROI & Northern Ireland) and the Isle of Man. We don't usually include anything taking place in a pool (even an open air pool), nor do we include Triathlons or Aquathlons. If you find an event that does not meet the above criteria then just treat it as a Brucie Bonus but do not assume that we have extended our coverage. - Why can I not see any past events? For performance reasons the app only holds and shows details of future events. Events continue to be shown for a couple of days after they have taken place and are then dropped from the listings. If you need to access details about past events then we suggest that you use our website. The app will only attempt to download a new file if it detects that the version on the Interweb is newer than the file on your device. - Why am I not seeing any events? Firstly, the app will need network access to download a file from the Interweb that it will store on your device. It is only a small file. - What should I do if I spot an error or omission in the listings? - Is there a version for iPhone or iPad? Unfortunately we don't have the technical resources to develop a version for Apple devices.